Acronym of "Single Lens Reflex". See also "Reflex" model from Asahi Opt. Co. It was introduced in 1957. The Asahi Pentax S was the improvement of the AP, introduced in April 1958. These two sister models were the first steps of the very successful Asahi Pentax dynast. This year, 1997, marks the 40th anniversary of the introduction of the first pentaprism SLR from Asahi Opt. 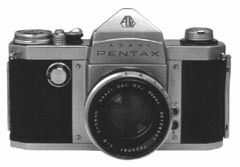 Co. (AOC), called the Asahi Pentax. There have been a number of ideas as to how the name was created, but according to information printed by AOC, the name was derived by merging the word "pentaprism" with the "flex" suffix from Asahiflex (earlier AOC models). The Asahi Pentax had no other model designation. The name can be considered Asahi (maker) and Pentax (model designation). Since later screwmount cameras sold worldwide by AOC bore the Asahi Pentax name and a model designation, the first pentaprism model is now usually called Asahi Pentax Original or AP by collectors to avoid confusion. According to Bob Rotoloni, the Pentax designation was also considered in 1948 by Nippon Kogaku for their first Contax-inspired rangefinder camera, but was rejected in favour of the then famous Nikon brand name. This, in my opinion, was a right decision because the Pentax name had little to do with rangefinders. It is also possible that managers at Nippon Kogaku were reserving the Pentax name for their SLR, however, their model F of 1959 arrived two years later than Asahi's first pentaprism SLR. The Asahiflex range of cameras developed quickly. The line included a prototype in 1951, the model I introduced in 1952, the model IA introduced in 1953, the model IIB in 1954, and the model IIA in 1955. No new models were introduced in 1956. The only substantive production change made by AOC was to begin using the model IIA chassis in the production of the model IIB. It has been speculated that interchangeable pentaprism versions of the Asahiflex were made for evaluation and possible sale. 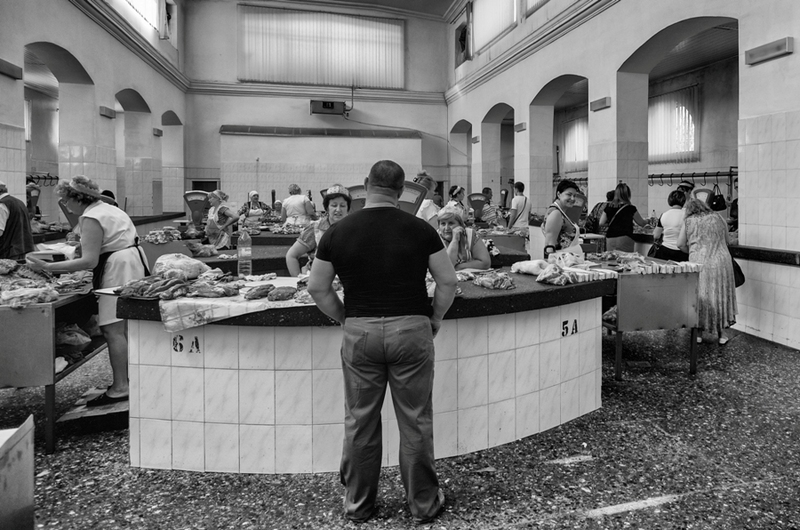 To date, the author has never documented a public showing of such a camera or any photographs. At this time, the pentaprism Asahiflex is only myth yet to be proven. During this time, the Asahi engineers were hard at work, and, in May 1957, the new fixed-pentaprism SLR camera was introduced. This was the beginning of the famous Asahi Pentax line which would be improved step-by-step over the next twenty years. A compact octagonal body with rounded corners (although taller than the Asahiflex), a well designed control layout, and an elegant pentaprism housing (bearing the now classic arc over the Asahi Pentax name) all gave the Asahi Pentax its distinctive style. The Asahi Pentax stylish design, high quality finish, and quality construction contributed greatly to the success of Pentax cameras. These qualities were perceived by customers as making the camera more refined than other cameras on the market. As indicated by the quality exterior finish and styling, the Asahi Pentax was a reliable and well engineered camera on the inside. 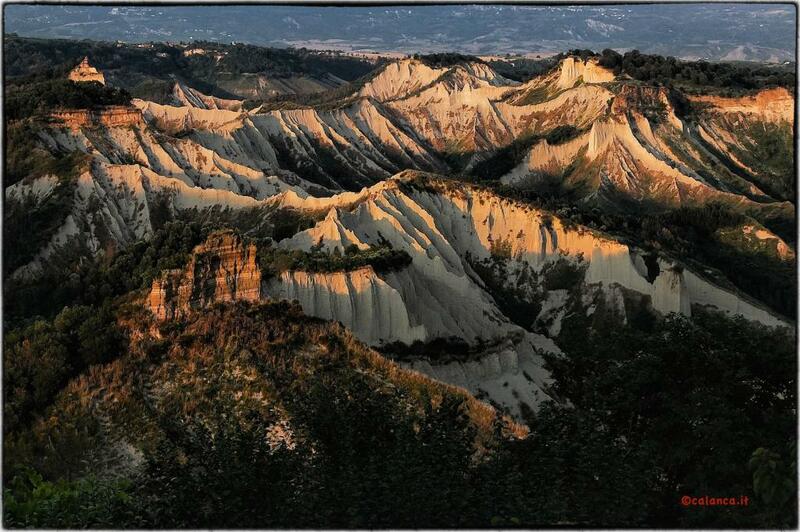 The reliability of Asahi Pentax always placed them among world's finest. The Asahi Pentax was the camera that brought about a styling that was years ahead of competitors, and would go unmatched in innovation for many years. The Asahi Pentax was one of the most innovative cameras of the era. Besides its stylish design, it introduced technical improvements and specifications that would set industry standards. The Asahi Pentax was the first Japanese SLR with fixed pentaprism viewfinder for eye-level vision. It has been acknowledged as the world's first SLR with a right-hand wind lever (the Exakta had a left-hand one, while all other SLR's of that era had knob winding systems), the first with a fold-up rewind lever, and the first camera with both eye-level prism and instant return mirror (the Asahiflex IIB had instant return mirror only). Some authors also identify the Asahi Pentax as the first SLR with microprism aid on the focusing screen. While the Asahi Pentax was a new design, collectors can also see the heritage passed down from the Asahiflex line. The Asahi Pentax was a substantial improvement, not a simple refinement. The central section of the camera changed very little from the Asahiflex to the Asahi Pentax. The film chamber, back, latch, flash syncs, interior focal plane shutter design, and many other features were either unchanged or very similar in design to the Asahiflex. The most visible and technologically important difference was, of course, the new fixed pentaprism viewfinder. 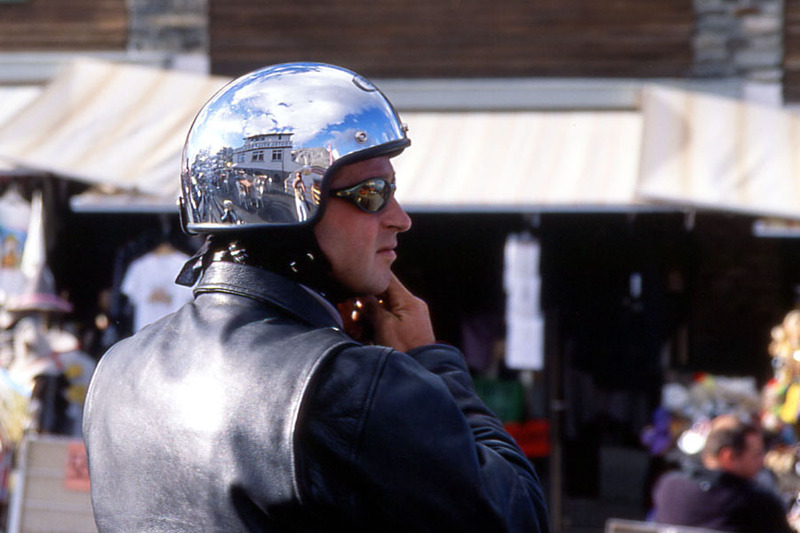 This design was so well thought out that the shape and look remained unchanged up to the SP1000 model of 1974. The ground glass focusing screen has Fresnel field lens to reduce light falling off at corners and a newly developed circular microprism grid for easy focusing. 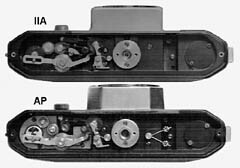 The supplemental optical viewfinder of the Asahiflex was eliminated from the design, while the rewind knob was replaced by a more comfortable hinged rewind crank. The rewind crank was surrounded by an ASA film reminder dial. On the right side of the camera, the wind knob and simple exposure counter ring were replaced by a modern rapid wind lever with a much improved frame counter. The rotating shutter speed dial was also greatly improved over the Asahiflex. On the Asahiflex, the selected shutter speed was only visible when the shutter was advanced (cocked). On the Asahi Pentax, AOC incorporated a new design that would show the selected shutter speed at all times. AOC improved the shutter release by making it function with the standard cable release thread. The strap lugs were made more robust and positioned higher in the top housing area. Besides adding the one second speed, the slow speed dial on the Asahi Pentax looks a little different than that on the Asahiflex IIA. 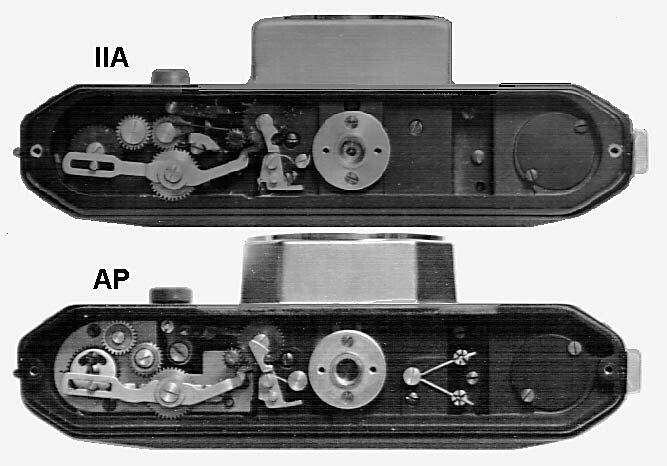 A comparison of the Asahi Pentax to the Asahiflex camera body shows that the base is identical. The body cast on the Asahi Pentax is taller and a little different, as indicated by comparative pictures taken after baseplates are removed. While the concept of the shutter and mirror operation between the two cameras is the same, the gear style and types are different. The push-button film rewind release of the Asahi Pentax replaced the lever type of the Asahiflex. The mirror box construction is similar, but, the mirror on the Asahi Pentax is slightly wider. The lower corners of the frontal mirror box housing are cut and the lens thread of the Asahi Pentax flange is M42x1 in place of the old M37x1 of the Asahiflex. The mirror box housings are interchangeable between Asahiflex and Asahi Pentax by simply unscrewing four screws on their corners. This interchangeability made hybrid versions possible. Some Asahiflex bodies with M42x1 lensmount have been located from time to time, but, they were likely custom made or repair shop modifications. AOC confirmed that no M42x1 Asahiflex have ever been produced by the company. It may also be of interest to the readers that M37x1 retrofit versions of lenses designed for the Asahi Pentax were manufactured and sold to Asahiflex owners. These included the 83mm f/1.9 and the 135mm f/3.5 Takumar lenses. In addition, M42x1 versions of the Asahiflex lenses were manufactured by AOC and sold to Asahi Pentax owners. Examples of these lenses have included the 50mm f/3.5, the 83mm f/1.9, and the 100mm f/3.5 Asahi-Kogaku Takumar models. The AP was the first Asahi camera available in either satin chrome or all black finish, the latter being rare. The black version was equipped with a matching all black standard lens, while the chrome one had chrome finished aperture and depth-of-field rings. The Asahi Pentax was also sold by Sears, Roebuck and Co. as the Tower 26. The Asahi Pentax model of 1957 had a six-digit serial number. Six digit numbers continued on later model Asahi Pentax cameras up to 1964. Registered serial numbers range from 132691 to 153211 (approximately 132500 to 154000 according to Mr.Sherfy), however it is believed that less than 20,000 units were produced. The standard lenses for the Asahi Pentax were the 58mm f/2 Takumar, the 55mm f/2.2 Takumar, and the 58mm f/2.4 Takumar in Pentacon/Pentax M42x1 screw mount. The Tower 26 version of the Asahi Pentax was only sold with the 58mm f/2.4 lens. A variation of the Asahi Pentax Original was the Asahi Pentax S. It was introduced in April 1958 and discontinued in May 1959. Visible differences between the Asahi Pentax and the Asahi Pentax S include the different progression of shutter speeds (with the latter featuring the modern near arithmetical progression of speeds) and a different film reminder dial. The film reminder dial was the same as that found on the next Asahi Pentax K (the third and last model of the first series of Asahi Pentax cameras). Since the Asahi Pentax S was sold at the same time as the Pentax K, it can be considered to be a budget version of the Pentax K. The Asahi Pentax S was also available in either satin chrome or all black finish, both being uncommon. The Asahi Pentax S also had the S model designation 'S' marked below the serial number. A few early bodies have been reported in the literature with no model designation at all. It is possible these examples represent damaged Asahi Pentax S cameras with top housing plates replaced with spare AP plates, bearing the AP lower serial numbers. Registered serial numbers for the Asahi Pentax S range from 150981 to 165354 (154000 to 162000 according to Mr.Sherfy) and a total production of less than 4,000 pcs has been estimated by Fred Sherfy in his book. The standard lenses for the Asahi Pentax S were the 55mm f/2.2 Takumar or the 55mm f/1.8 Takumar in Pentacon/Pentax M42x1 screw mount. Flash synchronization: around 1/45 sec. Other features: Automatic frame counter with manual reset, X and FP standard sync sockets, non-interchangeable back, rewind button and tripod socket on bottom plate, loaded film reminder dial. Period of production: May 1957-April 1958 (April 1958-May 1959). The original article was published on SPOTMATIC magazine #14, October 1997.